Order a copy of What Happened to Worksite Enforcement? at Amazon.com. 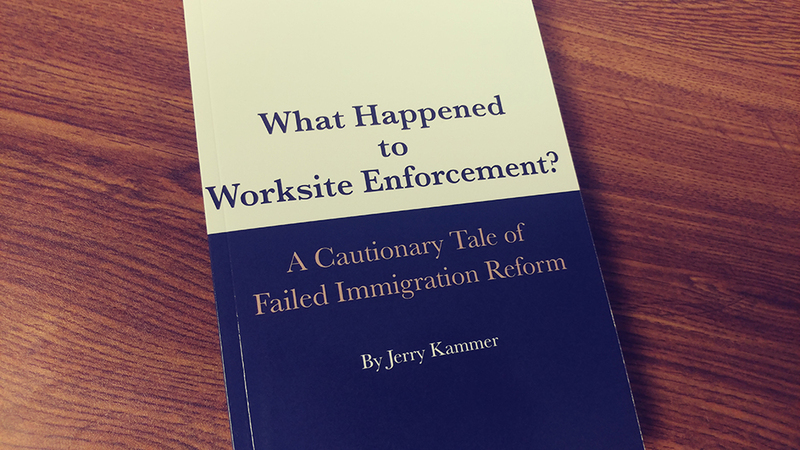 A new book by CIS Senior Research Fellow Jerry Kammer offers the most comprehensive and detailed account yet of three decades of failed workplace enforcement to weaken the magnet of jobs that pull illegal immigrants to the United States. Kammer, a veteran reporter and winner of the Pulitzer Prize, combines archival research with numerous interviews of key players to offer a readable, compact history of the 1986 act banning the employment of illegal immigrants, and the subsequent bipartisan failure to follow through. This timely book comes just as Congress again takes up debate on the tools needed to control illegal immigration. After five years of congressional back-and-forth, a bipartisan deal was struck in 1986 that coupled a one-time amnesty for about three million illegal immigrants with mandated civil and criminal sanctions against employers who knowingly hired unauthorized workers in the future. But soon after passage of the Immigration Reform and Control Act, the enforcement component of the compromise began to be undermined. Kammer's book traces that process over four administrations, with special emphasis on the Clinton and George W. Bush eras. As a result of that failure there are now three times as many illegal immigrants in the United States as before IRCA. Many of the politicians involved remain central to the debate today. Sen. Chuck Schumer, for instance, while still in the House of Representatives brokered the final deal to pass IRCA in 1986, and then gutted the back-taxes provision in the amnesty portion of that law. Sen. Rob Portman was a staff member of the 1970s presidential commission that recommended passage of employer sanctions, and withheld his support for the 2013 Gang of Eight bill because "if we don't fix the workplace, we cannot have an immigration system that works." The 128-page book is available in both paperback and Kindle format at Amazon. Traces the failure of worksite enforcement to multiple causes: structural flaws in IRCA that prevented establishment of a credible system for worker authorization verification; the political clout of business interests and immigration advocacy groups; the demoralization of federal authorities; and the ambivalence of public opinion that, while favoring limits on immigration, often recoiled from the human consequences of enforcement. Notes the ongoing failure of the executive and legislative branches to reform the defective worker verification process. The report says the Government Accountability Office functioned almost like a Greek chorus at congressional hearings, with its many unheeded warnings about the need for a credible system. Contrasts former INS commissioner Doris Meissner's assurance before the 1996 election that the government meant business when it came to enforcing immigration laws at the workplace with her 2007 acknowledgement that, "We never really did in any serious way the enforcement that was to accompany the legalization of the people who were here illegally." Notes that Congress, instead of fortifying worksite enforcement, spent billions of dollars on the politically less controversial Border Patrol. Kammer said, "I think a key period was the 1990s. Clinton was serious about enforcement, but he lost interest after he was reelected. The death of civil rights icon and former Democratic Rep. Barbara Jordan in early 1996 was also a terrible blow to the prospects for improving the fraud-ridden worker identification (I-9) process." The United States has yet to attain Ronald Reagan's goal of a "reasonable, fair, orderly, and secure system of immigration." But Kammer's work provides the foundation for meaningful on worksite enforcement, which is back in the news with Rep. Lamar Smith's reintroduction of a mandatory E-Verify bill in the House and talk of packaging a DACA amnesty with an E-Verify mandate.